Frank Joseph Thomas was born on June 11, 1929 in Pittsburgh, Pennsylvania. His parents were Slovak & Lithuanian born, raising their son a strict Catholic. At the age of twelve, Thomas began a six year period where he began studying to become a Catholic Priest. He eventually passed up on the vocation and by high school was playing baseball on the Canadian side of Niagara Falls. Even as a ball player Thomas, never drank, gambled or smoked, instead chose to spend his free time with his family. At six foot three, 200 lbs Thomas was a big man for his generation of ball players. He had tremendous power & could hit a baseball ball a long way. Big Frank was also very strong, he became famous for challenging people to throw a baseball their hardest at him, and he would dare to catch it with his bare hand. He claims to never have lost one of those bets. He was nicknamed “the Big Donkey” because of his awkwardness, but was still very versatile on the field, usually playing outfield but he also played the infield when needed. 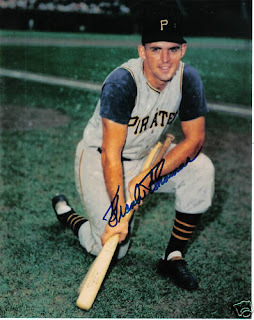 Thomas got signed by the hometown Pittsburgh Pirates in 1947 and hit 14 HRs for three straight minor league seasons. In 1951 he got better belting 23 HRs at AAA New Orleans, followed by a Southern league leading 35 HR season there in 1952, as he hit .303. Big Frank had arrived in the majors for good by 1953, after brief appearances in the 1951 & 1952 seasons. There were high expectations for the big Thomas when he arrived with the Pirates in 1953, especially after they had just suffered one of the worst seasons in baseball history, going 42-112. The expectations were so big that the team traded away the popular slugger & future Hall of Famer Ralph Kiner. Thomas did not disappoint, winning over the fans as he hit 30 HRs (7th in the league) and drove in 102 runs, batting .255. He was the only Pirate to have hit double figures in HRs that season. In 1954 he led all NL outfielders in assists (14) & was second with a .989 fielding %. Over the next six years in Pittsburgh, he made three All Star teams, hitting 23 or more HRs every season, including 30 plus HRs twice. He batted over .280 four times, & hit .290 or better twice, including a career high .298 in 1954. In the New York Giants last home game at the Polo Grounds in 1957, it was Thomas who made the last put out. In 1958 he had his best season, hitting 35 HRs with 109 RBIs (both second best in the NL). He posted career highs in double (26) hits (158) & batting average (.281). He earned 43% of the MVP voting, getting some celebrity status, even making the cover of Sports Illustrated in July 1958. It was the only season while playing in Pittsburgh that his team didn’t finish near the bottom of the standings. The Pirates finished in second place to the reigning World Champion Milwaukee Braves that year. 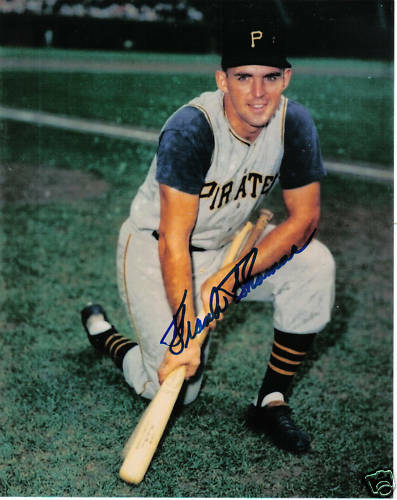 After the season ended he was traded to the Cincinnati Reds with Jim Pendelton & Johnny Powers, for catcher Smokey Burgess, Don Hoak, & Harvey Haddix, who all became key to the 1960 Pirates World Championship team. In 1959 Thomas was limited to 108 games, but still hit 12 HRs with 18 doubles & 47 RBIs before being traded to the Cubs at the end of the season. He hit twenty plus HRs the next two seasons as well, splitting time in 1961 between Chicago & the Milwaukee Braves. That season he had hit 27 HRs (9th in the league) with 18 doubles 73 RBIs & a .281 average, his best batting average in three years. In November of 1961 he was Traded to the expansion New York Mets for a player to be named later which turned out to be Gus Bell, and cash. Frank Thomas became an original Met and it is safe to say, the team’s first true hitting star. He had the best year by far, of anyone on the team & was the team’s first cleanup hitter. He was their main left fielder (126 games) also playing some first base (11 games) & third base (10 games). He led the team in most offensive categories and established various club records that were held for many years. Thomas debuted on Opening Day 1962 as the first Mets cleanup hitter batting fourth. He drove the second run in Mets history that day at St. Louis with a sacrifice fly scoring Felix Mantilla. 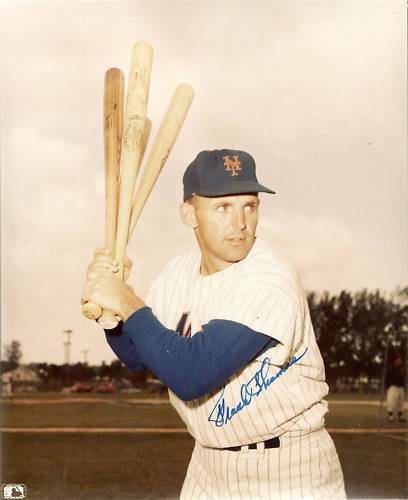 He hit the first Mets home HR, coming at the Polo Grounds off Pirates Pitcher Tom Sturvidant, in the second game of the season, the third HR in the team’s history. On April 19th he hit two HRs off the Cardinals Ray Washburn, in a 9-4 loss at the Polo Grounds to St. Louis. That April he also became the first major leaguer to get hit by two pitches in the same inning. It came in a April 19th Mets 8-0 win over the Philadelphia Phillies, both pitches came from Art Mahaffey. At the end start of May, Thomas already had hit seven HRs and was among the tops in the league. He hit seven more in the month of May while driving in 22 runs that month. He began the month with HRs on the first two days, then in mid May when the Mets went to Milwaukee, he hit HRs off the Braves Warren Spahn & Lew Burdette. He hit his fourth HR of that four game series in the second game of a May 26th doubleheader, leading New York to a 9-6 win. From there he cooled off a bit in the HR department, not hitting another until June 27th. Meanwhile he raised average up to .300 by the All Star break. In July Thomas hit four HRs on 12 game home stand to finish off the month. To begin the month of August he set a record (at the time) by hitting six HRs over a course of three consecutive games, (the record has since been broken in 2000). In that stretch he hit seven HRs in four games, with nine hits & twelve RBIs. On August 1st he hit two HRs at the Polo Grounds, including a grand slam while driving in a total of six runs against the Philadelphia Phillies, although the Mets still lost the game 11-9. In the next two days he hit four solo HRs, two in a game against the Phillies & then a pair against the Cincinnati Reds off John Jay. On August 4th (his fourth straight day of hitting HRs) Thomas was the hero of the second game of a twin bill against the Reds. He hit a walk off HR, off the Reds Moe Drabowsky for a 3-2 win. On September 14th he had a three hit day while driving in four runs, in helping New York to a 10-9 win over the Reds. He had another multi HR game on September 20th in Houston, while driving in three runs. Overall during the season, he had five multi HR games. On September 23rd, Thomas helped pitcher Roger Craig, earn a win as he homered early on & then had a walk off hit, against the Chicago Cubs Bob Anderson driving in Choo Choo Coleman. Thomas drove in both runs of the 2-1 win. He finished off the '62 season with a HR in the last game of the yeat at Chicago's Wrigley Field. His 34 HRs (6th in the NL) were a Mets club mark until Dave Kingman hit 36, in 1975, a full thirteen years later. His 94 RBIs were the club mark until 1970 when Don Clendenon drove in 97. Thomas also led the team in hits (152) runs (64) doubles (23) games played (156) & hit by pitches (8) while batting .266 on the season with a .329 on base %. In left field he had 13 assists (second in the NL) but led the league in errors there with 9. Quotes: Thomas enjoyed his time playing in New York- "We had a great ball club. We just didn't have any pitching. We scored a lot of runs but we lost a bunch of games in the seventh, eighth and ninth innings. If we could have had a closer like they have today, we might have been in the thick of a pennant race. It was great playing in New York. I really enjoyed playing for Casey Stengel. I've always said that he probably forgot more baseball than I'll ever know." On the road he was a roommate of Hall of Famer Ritchie Ashburn, the two were also roomies during their playing time with the Cubs. On the road the Christian man Thomas, didn’t go out into the night life, but usually went to a movie. In 1963 he started out the year slow, hitting under .200 most of the first two months. On April 25th he drove in all three runs, including hitting a two run HR at Wrigley Field in the Mets 3-1 win over his old Cubs team mates. 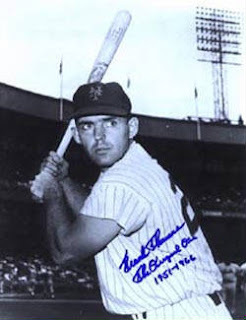 On May 7th his two run HR, led the Mets to a 3-1 win over the Phillies at the Polo Grounds. In the last two weeks of June he got hot, driving in 13 runs overall, including a four RBI, three hit day on June 14th in a 10-3 Mets win at Cincinnati. In a wild 14 inning game at the Polo Grounds on June 26th against the Cubs, he hit a two run HR & then later tied the game in the 8th inning with an RBI single. The Mets went on to beat the Cubs in the bottom of the 14th inning when Tim Harkness hit a walk off grand slam HR. Thomas had his best month in August hitting five HRs with 17 RBIs. In the last week of the month, he drove in runs in six of eight games including four straight. His numbers dropped off on the season as he missed some playing time, seeing action in 126 games. For 1963, he still led the team in RBIs (60) while hitting 15 HRs, with nine doubles & hit .260. In the outfield he posted a .988 fielding % with eight assists. 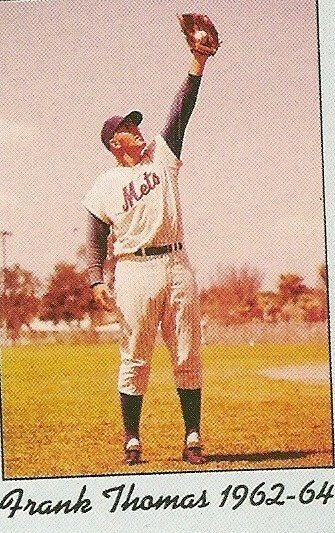 In 1964 he got to play in the first game ever played at Shea Stadium, batting 5th & playing in left field. He got an infield single & scored a run (the third Mets run at Shea in history) in the 4th inning. 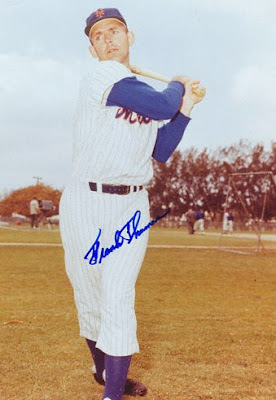 On May 22nd he drove in both Mets runs at Colts Stadium in Houston, helping Larry Bearnarth beat Hal Brown 2-1. He then missed five weeks of action returning on July 9th hitting a two run walk off HR leading the Mets to a 4-3 over the St. Louis Cardinals. 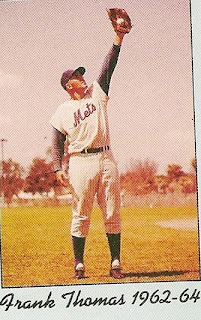 It was his last big moment in a Mets uniform, in August after 60 games he had hit only three HRs with 19 RBIs & was batting .254 when The Mets traded him to the Philadelphia Phillies in exchange for Gary Kroll and Wayne Graham. 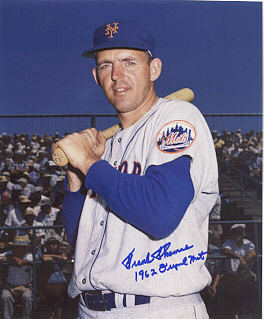 Thomas was at the end of his career at age 35, and in 1965 he bounced around with four different teams retiring at the end of the 1966 season. At the time he retired he was 40th on the All Time HR list with 286 (he is now at #150). In a 16 year career he batted .266 with 1671 hits 792 runs scored 962 RBIs 262 doubles 31 triples 51 hit by pitches a .320 on base % & 70 sac flies (140th all time). Retirement: Thomas still loves the game, and through the years has made appearances at card shows, fund raisers and private speaking events. He returned to Shea Stadium for the closing ceremonies in 2008. Thomas is also a proud supporter of the Baseball Assistance Team (BAT). "It takes care of indigent ballplayers that have fallen upon hard times," he said. "There are some widows who can't even afford to bury their husbands when they die."